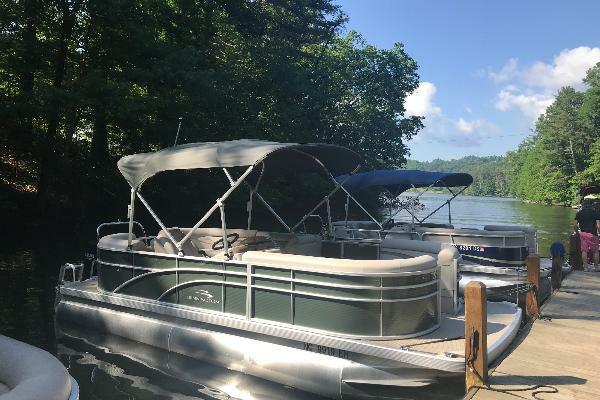 With a maximum seating capacity of ten and a top speed of 30mph this is the perfect choice for a more exciting day on the lake. Tritoons are the same as a pontoon but with a third &quot;toon&quot; underneath that provides a quicker ride making it the best option for: tubing, kneeboarding, wakeboarding and skiing. Details: 21' Bennington Tritoon with a 140hp fuel-injected 4-stroke Suzuki engine, Sony AM/FM CD stereo with auxiliary input, bimini cover over the back half, and a stern boarding ladder. per week Standard Rates do not include tax and fuel.